The International Commercialization Forum is an exclusive gathering of global thought leaders and practitioners from academia, business, government and industry all focusing on building robust, sustainable companies that are based on the results of publicly funded research. Hosted by the Ontario Centres of Excellence`s Centre for Commercialization of Research (CCR), the Forum will take place in Ottawa, Ontario, Canada on March 30th and 31st, 2011. Participation is by invitation only. During the two-day Forum, this select group of experts will engage in interactive sessions to discuss exemplary practices in commercializing research results and evidence-based effective innovation models from around the world. Participants will share the most compelling novel ideas to improve the state of global innovation. Create an International Commercialization Alliance as an ongoing forum for discussion and exchange of knowledge and ideas. I am pleased to nominate Rich Bendis, President and CEO of Innovation America as a top 5 candidate in the Innovation and Creativity category. 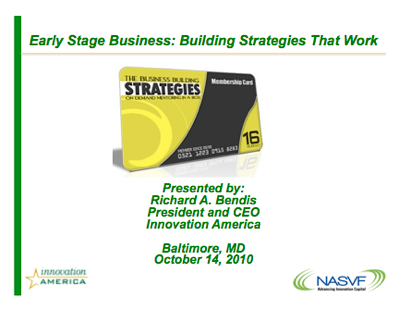 Rich is a globally recognized leader, practitioner and speaker on Innovation. Over the past 25 years he has successfully created, managed and advised some of the top innovation-based economic development organizations in the world. As publisher, Rich posts 25 new Innovation related articles every day and his publication is read in 185 countries. His demand continues to increase as an “Innovation Evangelist” which has now reached 5 Continents, numerous Countries and their innovation leaders. 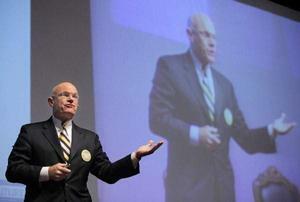 His inspirational speaking engagements are all by referrals as he delivers and exceeds his audience’s expectations. 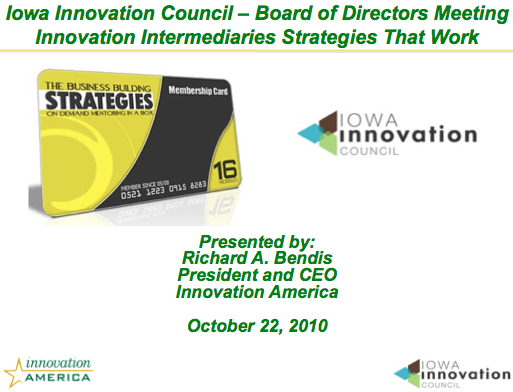 Rich Bendis is truly worthy of this recognition as a Top Innovation speaker. Scroll Down to section 7 "7) Current Leading Nominations in Innovation / Creativity"
Press the "Submit Nomination Form"
In a lingering recession, seed money to develop new technologies in the private marketplace is more difficult to find than ever. But for intrepid entrepreneurs with good—no, make that great—ideas, the federal government is willing to help. An array of programs designed to help move new technology to the marketplace and spur the economy exists across the federal spectrum. Not surprisingly, the Small Business Administration is at the forefront of this effort with its Small Business Innovation Research (SBIR) and Small Business Technology Transfer programs (STTR). SBIR allows qualified small businesses to compete for research and development financing by proposing innovations that meet the needs of the federal government. The program is a highly competitive, three-phase award system, specifically designed to fund research and development activities that private sector investors may label “too early” or “too risky.” SBIR, and its sister, STTR, encourage small firms to undertake scientific research that helps meet federal R&D objectives, and have high potential for commercialization if successful. The German Center for Research and Innovation (GCRI), in cooperation with HANNOVER MESSE Research & Technology, the leading international trade fair for R&D and technology transfer in Hannover, Germany, hosted a panel discussion on national frameworks, practices, and funding schemes for early- stage high-tech companies in the U.S. and Germany on October 26, 2010. At the German House New York, Richard Bendis, President & CEO of Innovation America, Edward Reinfurt, Executive Director of the New York State Foundation for Science, Technology and Innovation, and Christos Christodoulatos, Associate Provost to the Office of Academic Entrepreneurship, Stevens Institute of Technology, discussed how to adopt best practices and to access seed money to establish university spin-offs and other successful examples of research commercialization. Kurt Becker, Associate Provost for Research and Technology Initiatives and Professor of Physics at the Polytechnic Institute of New York University, moderated. Referring to the 7th Annual Conference of the Technopolicy Network, which took place in Heidelberg, Germany, on September 30 and October 1, 2010, the first speaker Richard Bendis said that transatlantic knowledge clusters are an emerging and growing trend. However, one of the challenges for small businesses, according to all speakers, is the relationship between competing in a global market and international collaboration. 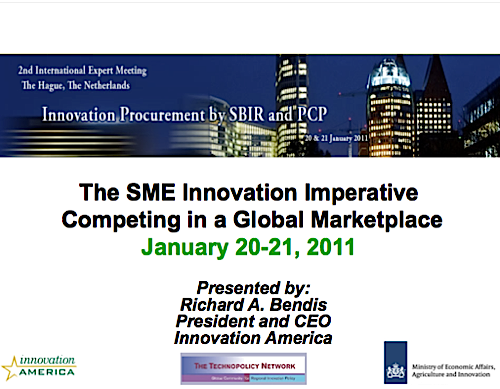 Mr. Bendis, a seasoned entrepreneur with experience as a corporate executive and venture capitalist, gave an overview of the Small Business Innovation Research (SBIR) program, which has been supporting small businesses since 1982. While in Germany the first research program was established at a Berlin university as early as 1821, in the U.S., the impetus for innovation historically has come from the adoption of technology from military to private market use. The 1982 SBIR/STTR (Small Business Technology Transfer) programs represent one of the first national policies intent on systematically fostering innovation in the U.S. alongside state-level economic development initiatives. Additional programs were initiated by the Clinton and Obama administrations in the 1990s and 2000s. The answer to improving Iowa's economy lies more with igniting startup companies such as BodyViz, Dwolla and Sensr than luring big companies like Google, IBM and Microsoft to the state, influential business leaders believe. Members of the newly created Iowa Innovation Council say the state needs to drive its economy through innovation, a long-term structural change that promises Iowans better-paying jobs. The group plans to start a seed fund, used to invest in young companies, raising as much as $100 million in private investment within three years. The fund would invest $500,000 to $3 million in promising startup companies, targeting bioscience, advanced manufacturing and information technology, organizers say. Richard Bendis is an accomplished entrepreneur, corporate executive, venture capitalist, investment banker, technology-based economic development leader, international speaker and consultant in the technology, health-care and innovation development industries. Bendis is the founding president and CEO of Innovation America, a national private/public partnership focused on accelerating the growth of the U.S. entrepreneurial innovation economy. He also founded the Bendis Investment Group, a financial intermediary and consulting firm. Bendis recently provided interim CEO consulting services to the National Association of Seed and Venture Funds and strategic growth and repositioning services to the Pennsylvania Biotechnology Center. entre empresários e dirigentes empresariais dos três países. com a audiência as últimas novidades em termos de inovação. mais potencial para inovar”, observou. Rich Bendis (NASVF Vice Chair and President/CEO Innovation America) participates in the session “Early Stage Business: Building Strategies That Work” with Rich Lunak (Innovation Works), Lisa Delp (Ohio Department of Development) and moderator Mark Huston (Cimarron Capital Partners). WHEELING - West Liberty University President Robin Capehart and Huntington-based hip-hop artist K-Kutta come from different backgrounds, but both believe entrepreneurship is key to West Virginia's future. "We need job creators. We need people that have the will to go out and take a risk, like these gentleman have done," Capehart said of Kutta and Luke Glass, vice president of Morgantown-based ListHub.net, during the final day of the 2010 Create West Virginia conference Tuesday at Oglebay Park's Wilson Lodge. Folks from all over West Virginia came to the Wheeling conference to help find ways to develop the state's new economy. During the Tuesday panel discussion regarding the benefits of starting new businesses in the Mountain State, Capehart said West Liberty is making a commitment to ensuring students realize they do not have to work for someone else when they graduate. Only 15 University Sponsor Slots Left! 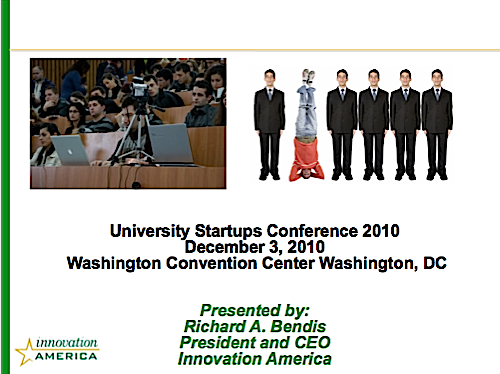 The University Startups Conference will take place December 1-3, 2010 at the Washington Convention Center, Washington, DC. The University Startups Conference is a unique conference series dedicated exclusively to creating and funding university startups. We bring together universities creating startups with VCs, angel investors, Federal Government program managers and Fortune 500 companies that fund them. The Conference is organized annually by the National Council of Entrepreneurial Tech Transfer (NCET2.org). This year's University Co-Hosts are the University of Maryland and Boston University. The Government Co-Hosts are the National Science Foundation (Division of Industrial Innovation and Partnership) and National Institutes of Health (Office of Tech Transfer). The Embassy Host is the British Embassy. The venture capital sponsors are the National Venture Capital Association (NVCA) and the National Association of Seed and Venture Funds (NASVF). The German Center for Research and Innovation (GCRI), in cooperation with Hannover Messe Research and Technology, the leading international trade fair for R&D and Technology Transfer in Hannover, Germany, will host a panel discussion on the national frameworks, practices, and funding schemes for early-stage high-tech companies in the United States and Germany. The event will take place on Tuesday, October 26, from 6:30 to 8:30 p.m., at the German House New York (871 United Nations Plaza, btw. 48th & 49th Streets). Richard Bendis, President & CEO of Innovation America, Edward Reinfurt, Executive Director of the New York State Foundation for Science, Technology and Innovation, and Dr. Thomas Lechler of the Howe School of Technology Management at Stevens Institute of Technology will discuss best practices, accessing non-domestic sources of seed money to establish university spin-offs and the effects of the world economy on tech transfer, tech commercialization, and finance. Their discussion will include examples, opportunities, and obstacles of international collaboration. Of particular interest for public and private sector technology transfers and technology marketing managers, venture capital and economic development professionals, the panel will also focus on other vehicles of successful research commercialization. Kurt Becker, Associate Provost for Research & Technology Initiatives and Professor of Physics at the Polytechnic Institute of New York University, will moderate. 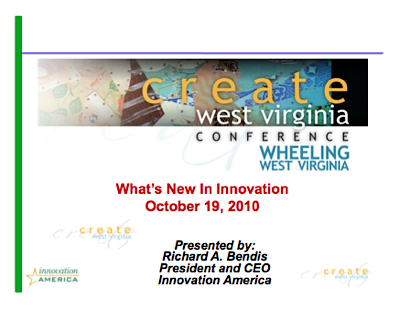 WHEELING - The spirit of innovation is running wild in Wheeling, as the 2010 Create West Virginia conference is set to go at different locations throughout the city next week. "The new economy is about research, technology, arts and culture, and innovation," said Create Chairman Jeff James. "We are teaching local communities how to use tried and true strategies to build that new economy." The conference - which James said should draw 250-275 people from all over West Virginia and the United States - begins at noon Sunday at Oglebay Park. Richard Bendis, fundador e presidente executivo da Innovation America, defende que “Portugal deve concentrar esforços em clusters em que é competitivo”. Para este consultor norte-americano, que proferiu uma conferência na cimeira da COTEC — Associação Empresarial para a Inovação realizada esta semana no Porto, Portugal deve melhorar a imagem de país inovador no estrangeiro.